Germany joined the Euro Area on 1 January 1999. According to Eurostat, nominal GDP of Germany in 2017 was 3 263.4 bln EUR. Germany underperforms the European Union in terms of real GDP growth with	the average annual differential coming to -0.2%	over the past 10 years (2007 - 2017). In 2017 real GDP growth was 2.2% which was below the Euro Area average (2.3%) and below the European Union average (2.4%). Real GDP growth in 2018 - 2023 are IMF's estimates. Chart 1. 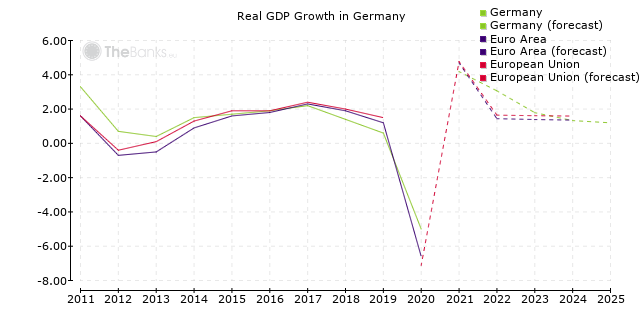 Real GDP Growth in Germany. Source: Eurostat, International Monetary Fund. In 2017, nominal GDP per capita in Germany was 39 500 EUR. 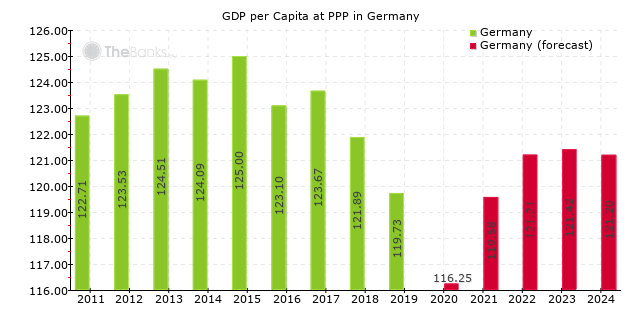 Germany has an above-average level of wealth in terms of per-capita GDP	at purchasing power parity (PPP); this economic welfare indicator has, on average,	exceeded that of the European Union by 20.7% over the past	10 years (2006 - 2016). GDP per capita at PPP in 2017 - 2023 are IMF's estimates. Chart 2. GDP Per Capita at Purchasing Power Parity in Germany; European Union = 100. According to Eurostat, inflation rate in Germany in 2017	expressed as annual percentages of average consumer prices was 1.7% which was above the Euro Area average (1.5%) and equal to the European Union average (1.7%). Inflation rates in 2018 - 2023 are IMF's estimates. Chart 3. 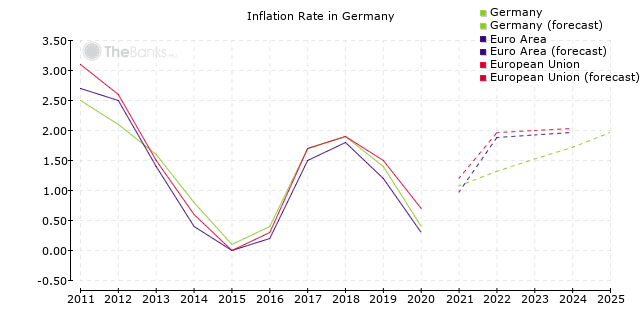 Inflation Rate in Germany. Source: Eurostat, International Monetary Fund. According to Eurostat, unemployment rate in Germany in 2017 was 3.8% which was below the Euro Area average (9.1%) and below the European Union average (7.6%). Unemployment rates in 2018 - 2023 are IMF's estimates. Chart 4. 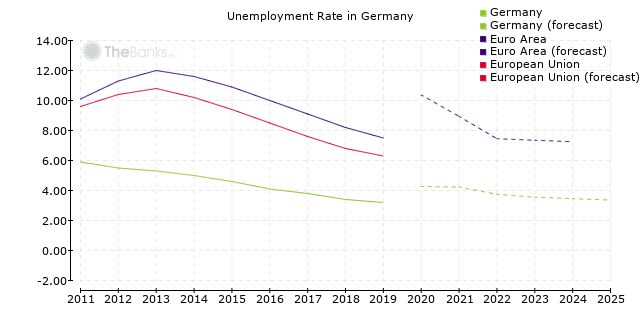 Unemployment Rate in Germany. Source: Eurostat, International Monetary Fund. 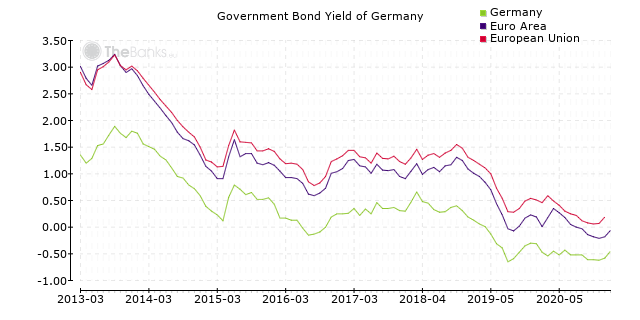 According to Eurostat, government bond yield in Germany in February 2018 was 0.66%, compared to 0.47% in January 2018. Chart 5. Government bond yield of Germany. Source: Eurostat. Germany has sovereign credit ratings assigned by Fitch and Moody's: the rating set by Fitch is AAA (highest credit quality), outlook stable; the rating set by Moody's is Aaa (prime), outlook stable.